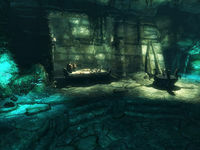 Lost Echo Cave is a Falmer-infested cave near the northwestern coast of Haafingar. It is located on a bend where the road that leads west past Fort Hraggstad turns to the south. There are piles of stones marking steps from the road up to the entrance, which unusually for a cave is a wooden door with lit candles on either side and a statue to the right. At first sight, the cave seems to consist of just two chambers. When entering, there is a dimly glowing tunnel that leads to the first, misty chamber, which contains a large urn. There is another tunnel that leads to the second chamber. Opposite the tunnel is an altar with numerous items on top, including random armor, gauntlets, helmet, war axe and dagger, as well as three burial urns, a silver necklace, the book Old Tome, and a copy of the One-handed skill book 2920, Morning Star, v1. There is also a ceremonial brazier which can be activated by burning a glowing mushroom in it. This opens up a hidden door. There are many mushrooms found growing on the cave walls throughout the cave system as well as several hanging moss and a patch of fly amanita fungus growing in one of the tunnels. There is a burial urn, partially buried behind the large pillar in the second chamber. Once you have opened the hidden door to the east, the tunnel leads to another chamber containing two Falmer, one of which is a magic-user. The chamber contains two Falmer tents and a fenced area with chaurus egg sacs and three loose Chaurus eggs. One of the tents is on a ledge above you, to reach it head towards the next passage and turn left behind the large pillar on the left and there is a ramp up. Inside the tent is a Falmer weapon and to the right is a Falmer chest. The other tent is to the right of the passage and has a gate. It contains four loose glowing mushrooms. To the right of this tent is a quicksilver ore vein. Along the next passage is a Falmer nest on the left-hand wall, which houses a Falmer that will jump out as you approach. Just after the nest there is a side tunnel heading south. Take care as there is a tripwire around a corner at the bottom of a slope that triggers a claw trap from the left. There is also a leveled magic-using Falmer. At the end, past an open gate is the bodies of a dead bandit and Imperial, with an unlocked Falmer chest beside them. Back in the main passage, there is another Falmer nest with a leveled Falmer inside. Around the next corner are two more nests both containing Falmer. On the left is a brightly lit spot with rocks that can be climbed and a hole in the ceiling with some hanging moss growing, under this hole on the rocks is a medium coin purse, a satchel and random fortify skill potion. The passage opens up into the final area where two chaurus, a leveled chaurus hunterDG and a leveled Falmer are all near each other, leading to another challenging fight. Once dealt with there are many chaurus egg sacs, a Falmer nest and a tent with a gate containing an unlocked Falmer chest. There are plenty of human bones scattered around and to the left of the tent is a short tunnel with a handle on the left that opens another concealed door at the end which provides a short-cut back to the first chamber. 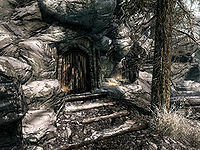 Although Lost Echo Cave is physically located within the borders of Haafingar hold, in the game data this cave is identified as being within Falkreath Hold. This means that you may be sent here as part of Falkreath quests, but not as part of Haafingar quests. It is possible to enter the cave already having the sliding rock doorways open rather than closed, so when you offer the glowing mushroom in the ceremonial brazier, it results in the doors closing rather then opening. ? This page was last modified on 28 July 2017, at 18:55.